It’s been six months since we touched down in Parma, Italy, and made our way to the inaugural Wildays show. Of all the show’s highlights, one stands out from all the rest. 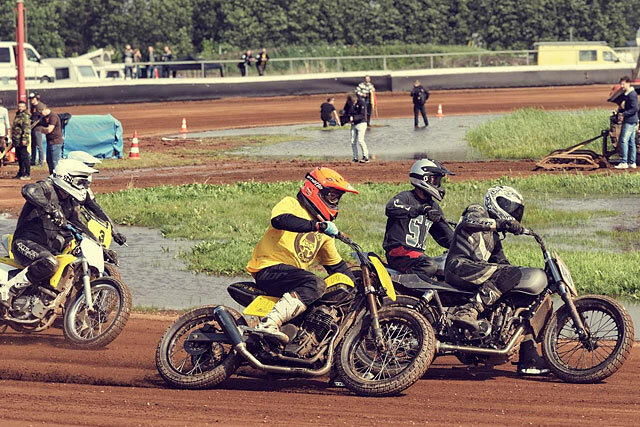 The flat track racing. Moto Adonis’ Daan Borsje was dead keen to have a go. So keen, in fact, that he organised a team uniform from John Doe; a team that somehow I was a part of. Next thing you know, we were all going hell for dusty leather on Yamaha SRs. I was smitten and so was Daan. But Daan had the drive to actually do something about it. And the next thing you know… Here’s Daan to explain the madness. 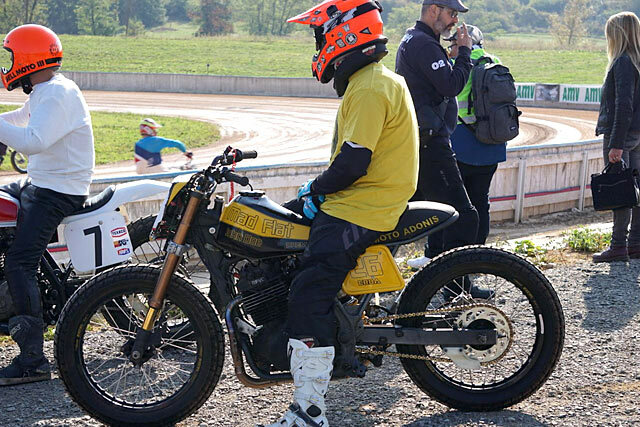 Why is Moto Adonis racing a tracker? When I heard about the Hells Race in Lelystad a while ago something triggered me. Maybe it was just because you can race your street bike with almost no adjustments in their hooligan class. Basically, you can have tons of fun for almost zero money. What’s not to like? 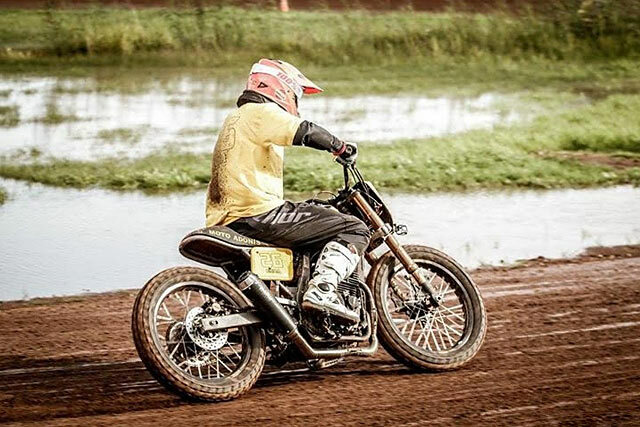 Then Pipeburn asked me to go to Wildays, which had a flat track course. I talked to Timo of John Doe Clothing and Andrew from Pipeburn and somehow they agreed to try this crazy sport with me while we where down there. Of course I crashed (So did I – Andrew), but I have not had that much fun in a long while. 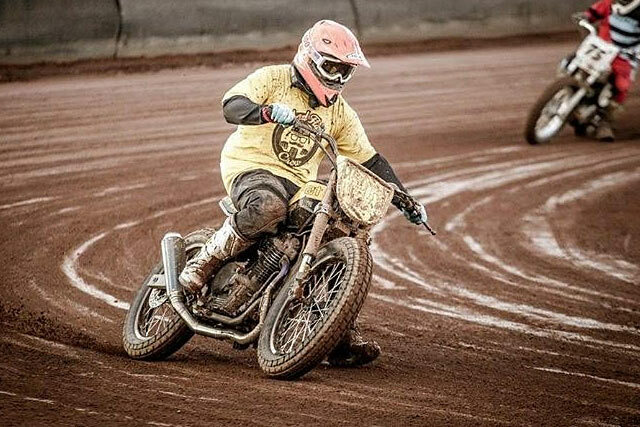 Playing in the dirt like a child, feeling the throttle in the corners, eating dust… what’s not to like! Anyway, later that night I ran in to Stefano Erba who was wearing a Hells Race t-shirt. He is the Sales Manager of Parts Europe Italy, and an Italian who now lives in Germany. He also has a background in Motocross. As you do, we started to talk about beers and bikes. Later on he told me he had won a Hells Race event on his first try with his almost stock Honda NX650 dominator. He also added that he was going to give it a try at Wildays. It turns out that he wasn’t totally happy with his bike; the seat was the wrong height and it had 18″ rims on it but it required 19s, which wouldn’t fit. Besides that, he adored the bike. We had a beer and talked about rebuilding his bike for free if he would race on behalf of Moto Adonis, because what’s cooler than having your own racing team? Coming home, I discussed the idea with Timo again. I thought that if he could sponsor the gear and help with the finances, I could put in some time and money and we could have blast together. Turns out we were right! Then the Dremel tool company came to me and asked if we could work together. I explained my idea about building a tracker and racing it. They loved the idea and asked if we could make a movie about it. Man, I love it when a plan comes together. I called Stefano and asked what bike we were going to use. 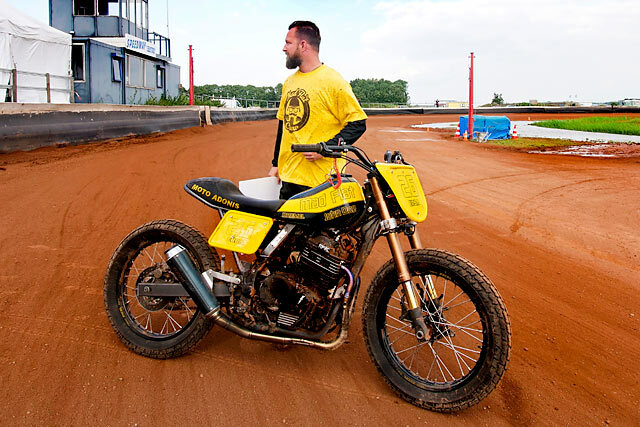 He said he would only ride a Honda NX650, because he loved the throttle response and he really wanted to go for a classic bike, which of course I could completely understand. So we bought an ‘88 Honda NX650 Dominator and got to work. We replaced the front fork for a stiffer GSX R1000 unit, because I had heard the guys from Lelystad speak about avoiding soft suspension on flat trackers. Then we cut off all the unnecessary parts and made a new rear frame with some extra tubes for stiffness. We also replaced the huge factory tank for a XL500 unit. Then we made a seat with an anti-slip surface and replaced the rear suspension for a brand new HK unit. 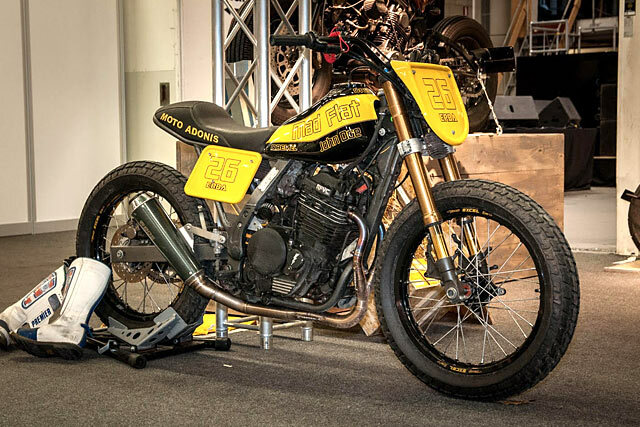 We replaced the Honda rims for two 19″ hoops and put some proper flat track tyres on it. The front brakes were binned because who needs them anyway? The Honda RFVC engine was given a ‘stage 1’ tuning which included a new high comp piston. Then we asked Don “The Indian” de Vink to build us a performance exhaust. He’s a well-known guy in Formula One and Moto GP circles. We were so happy with it, we created a Kickstarter called Mad Exhausts, and we now deliver handmade performance exhausts all over the world. The end result is a Honda that weights 127kg, has 50hp and 62nm of torque. 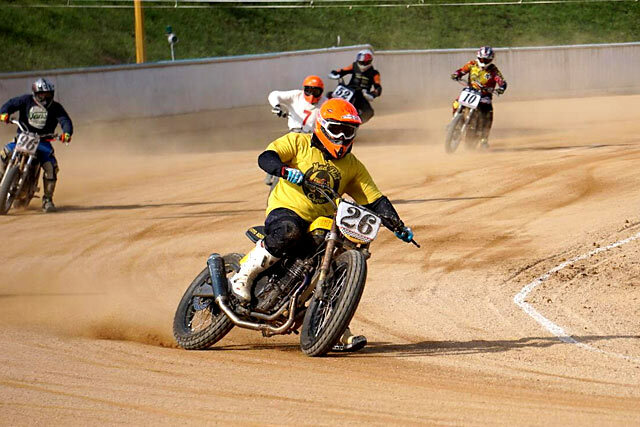 Stefano raced seven times over two weekends on our flat tracker. 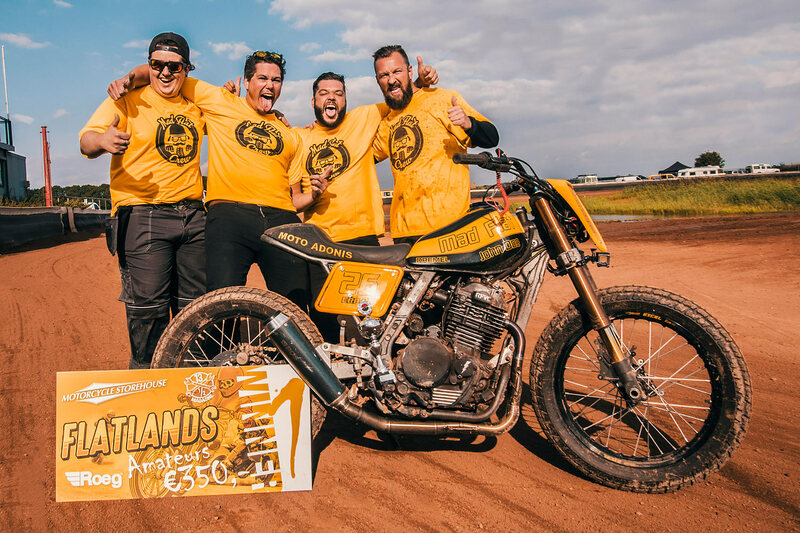 He won Hells Race on his own bike, and the Flatlands Festival and Vintage Classic Races in France on ours. At VCR we adjusted the bike a little bit more and he won again in a final race against the best of each previous group. This guy has got balls of steel and the riding skills of a madman. You will see more of him and us next year!